Apple Turnovers — What the Fruitcake?! We're nearing the end! I'm happy, I'm sad, I'm weary, I'm excited. Only four contestants left. Who do I want to win?! I just don't know! But I'm getting ahead of myself. First my recipe, then Bake Off talk. And besides, these might not be Show Stopper, but they certainly are Gob Stoppers ie. delicious autumnal treats that will keep the kids quiet while they stuff their faces, for a little while at least. Apple Turnovers. It's like apple pie, but with puff pastry, and in a different shape, and all buttery and flaky and stuff. Okay, so the only thing in common with an apple pie, is in fact, the apple. A minor details. The first time I ever made apple turnovers was when a neighbour, still a stranger, handed me some odd and slightly gnarled little apples that had come off another neighbour's tree because she remembered that I'd once said in passing that I liked to bake. I'm not one for apple pie (now, now, don't be like that, I'm still awesome) so I didn't really have anything in mind when I got back to my kitchen with them. But, I had just learned how to make my own puff pastry in a Daring Baker's challenge and still had some pastry left over. I did a quick Google search and apple turnovers popped up as a suggestion. That was settled. The next day I made my turnovers and then headed straight back over to my friendly neighbour to hand over the still-warm pastries. She invited me in for tea, and we've been friends ever since. I'm not kidding, it really happened like that. Turnovers are great in so many ways. You can assemble them ahead of time, and either leave them in the fridge until you're ready to bake them, or even have them stocked up in the freezer so that you always have something on hand for when the craving hits you or a friend stops in. You can also crisp them up in about 10 minutes in the oven if you've already baked them. Now, I didn't make my turnovers as puffy as they could have been, I rolled the pastry out to about 5mm, which is pretty thin, but if you prefer a puffier puff, then roll your pastry out thicker, simple! Although this is a baked recipe, I don't really consider it a baking recipe, in that you can play with the flavours and ingredients in the filling like you would when cooking. They can be made just as you like them, so see my apple filling recipe as more of a guideline rather than gospel. Add dried cranberries or raisins and currants. Maybe add pecans or walnuts. You could even swap out the apple for pear, or maybe get adventurous by adding a hint of rosemary or thyme. You could even make them savoury by leaving out the sugar and adding some of your favourite blue cheese. Honestly, as long as you like it, (almost) anything goes. As for the puff pastry, it's actually easier than you might think. The trick to making puff pastry is to keep everything cold, and a lot of patience. Cold weather permitting, you could have your puff pastry made in about five hours. Yes, five hours. Hence the need for patience. You never want the butter to melt and you don't want the thinning layers of dough separating the butter to tear, because those layers are what gives you that gorgeous flaky rise. When hit with heat, the butter melts and the steam created pushes those thin dough layers apart, leaving you with buttery light and crispy layered pastry. I'm telling you, it's baking magic. You can, of course, use store bought puff pastry, but then you lose all bragging rights. Just saying. Turnovers are great for breakfast, are a handy on-the-go treat, or you can even dress them up as a dessert if you serve them with some creamy vanilla ice-cream or clotted cream and a drizzle of caramel sauce. Hot or cold, they're just great. I hope you enjoy the video (further down), and with it, the puff pastry you'll hopefully be making to bake these lovely apple turnovers. Week 6 of the Great Irish Bake Off! This is one of my favourite themes as I think it really shows the technical level of a baker. It's fairly "easy" to bake a cake, it really is about following the instructions, but I think that pastry is a little more tricky. Besides having to know exactly what the texture should be, you also have to be particularly careful not to overwork certain pastry, and beyond that, the weather itself can play havoc on the process, so knowing how to work with the elements is also something that someone with pastry experience will show. First up, the Technical Bake! Barbara called it, the challenge set by Paul was Mille-Feuille. Even Paul admitted to being scared of this dessert, so can you imagine what the contestants were feeling. This dessert is made with rough puff pastry that's baked between two baking sheets to help control the rise, and in between those flaky layers of puff, it's filled with a delicious pastry cream of choice. Paul's challenge recipe had the outside covered with toasted almonds and the top classically decorated with a simple feathered design in royal icing. The judges must have a real wicked side, because it was another week that involved a custard, in this case, crème patissiere, and there was a curdled pot within the first minute. I think the judges have discovered the bakers' Achilles and are now just torturing them. First up, Will. His top layer of puff was baked beautifully, but the other two were rather under-baked and you could see the raw dough quite clearly once cut through, which was a real pity. Paul commented on the icing decoration on the top which was rather messy and Paul also thought the pastry cream was somewhat scarce. Maryanne's decorating skills shine from week to week. Her dessert was neat and tidy and she was the closest with regards to the way Paul had wanted the toasted almonds stuck to the sides. Clearly she's worked with royal icing before because she had very cleverly first piped a run out border to keep the royal icing in its place. But, Maryanne had slightly under-baked pastry in the middle and bottom layer of puff and was also a little bit stingy on the pastry cream. But, the cream was well cooked and a lovely texture. Aoife, at first, had also appeared to have held back with the pastry cream, but once cut, there was a lovely thick layer of it inside with the fruit. But, alas, another visibly raw puff pastry fiend. Barbara and Stephen joined in when they both made the faux pas of under-baking their puff pastry. Oonagh's mille-feuille was the best baked of the lot. The bottom layer was ever so slightly under-done, but nowhere near as bad as the others. But. No pastry cream. And that was because hers hadn't thickened up enough so it had made a run for it. This one was hard to call, every dessert had its issues, and they were bad issues. In sixth place was Barbara's Salvador Dali dessert and Aoife was fifth. 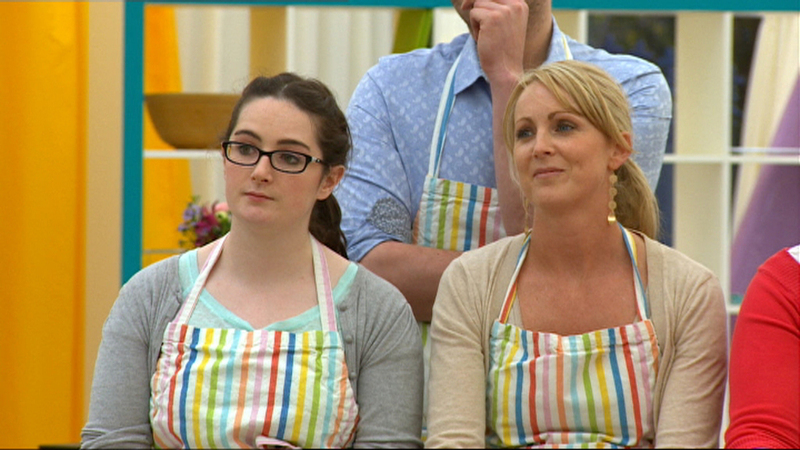 It was a close call between Oonagh and Maryanne for first, but Maryanne's neat and pretty mille-feuille got her the win. This was a Show Stopper week! Our bakers were put to the challenge of another classic French patisserie, croquembouche. First, a minor rant. I need to get to the bottom of why Irish people refer to most baked goods as "buns". It's not a bun, it's a cupcake. It's not a bun, it's a muffin. It's not a bun, it's a breadroll! (Okay, those are sometimes buns...) When someone Irish says that they like buns, they could be talking about several different baked things! In this case, Anna's "buns" were the choux pastry balls that make up the iconic dessert built in the shape of a cone. Each crunchy choux ball is filled with pastry cream, which are then assembled into this cone shape and glued together with hot caramel or sometimes chocolate. The Show Stoppers I was particularly looking forward to this week were from Will, Stephen and Aoife. Oonagh was not having a good time with her croquembouche. Every time we went back to her, something else was going wrong. Her first batch of puffs didn't rise nicely and she decided to start again, but there was something going on with her recipe, she ended up improvising because she just wasn't getting the correct consistency. And because of that, she forgot to make enough choux balls, so her chocolate box full of surprises was only going to be half full of surprises. I genuinely felt so frustrated for her. The chocolate was melting rapidly, either it hadn't tempered or it was the heat of the tent, and then some of her "box" pieces ended up breaking during assembly. She eventually managed to put it all together, but it was not a good challenge for Oonagh and I could feel her pain! Judging time, and first up was Maryanne. Her croquembouche looked amazing, but, she came straight out and admitted that she'd left the supporting cone in the middle, a no-no for this challenge as the ability to keep itself standing was part of the requirements. But I just loved the taste test. Biddy laughs and says, "His sweet tooth!" Apart from the cone support, she made a gorgeous dessert. Will was next, and this was one of the desserts I'd wanted to see. He assembled his choux puffs into a Dutch windmill structure which I thought was different. It had a tuille roof and shortbread windmill arms, very cute! But it looks as though he'd built it like you would a real windmill, Paul commented on the amount of thick and heavy caramel he'd used to cement everything together and thought they might need a Black & Decker to break it apart. Wrecking ball aside (did I see Miley Cyrus hanging around eagerly? ), the judges loved the flavour of the Grand Marnier and limoncello filling. Barbara did a huge no-no in my books. She assembled her croquembouche with chocolate, but she didn't temper the chocolate. If you're in the Bake Off and you personally choose to do a dish that requires melting chocolate, you should definitely know how to temper it. Big points lost for that, I'm sorry Barbara! Aoife's Tia Maria and Honeycomb Beehive was just too cute! Little cheerful yellow bees were perched happily near white chocolate flowers. The honeycomb crumbs were golden and just looked inviting, and would also add extra crunch. And crunchy it was, just like a Crunchie bar! Very cute! Stephen's tower was massive. Maybe it's because he's so tall so he just kept going, but it's as a croquembouche should be, a tall centerpiece that grabs your attention. Never mind the look of it, his flavours sounded amazing too. Pistachio and Amaretto. Yum! As Paul said, "This definitely put a smile on my face." I'm not even going talk too much about poor Oonagh's dessert, after Paul said he didn't consider it a croquembouche, well, enough's been said about it and I was just heartbroken for her. Lovely idea, just not executed well. On the plus side, they praised her flavours, so at least the substance was there. Week six was a tough one, and when it was time to decide which of the bakers would go through to the semi final, I think every single contestant looked more weary than normal. And then Anna told them that there were only four places available. Another double elimination. Ouch. This week's Star Baker was a choux in (ba da da dsssshhh!)... and it went to Stephen. His towering croquembouche had really impressed the judges and it was a well deserved title! But on to the sad. But wait, one more to go. Also not joining the others in the semi final was Aoife. This decision, I must be honest, I'm not sure I fully agreed with. Oonagh did well in her Technical but her Show Stopper really let her down. Aoife's Technical wasn't great, but I think her Show Stopper was lovely. It was a tight call, I guess. Again, very sad to see Aoife leaving. So, that's it, just four bakers left. Think I need a comforting apple turnover to settle my nerves. Speaking of turnovers, here's my video on how to make puff pastry! Posted on October 24, 2013 by Mandy Mortimer and tagged GIBO The Great Irish Bake Off Puff Pastry Apple Apple Turnover Autumn Baked Sweet Warm.